Posted 10:59 am by Rena Anya Devéza & filed under Alexander Technique, Alexander Technique Teacher Training. Right now, in my second year of Alexander Technique teacher training, I am feeling that the psycho part of me is yo-yo-ing back and forth between old, dark habits and new, healthier habits. A continual battle is going on. 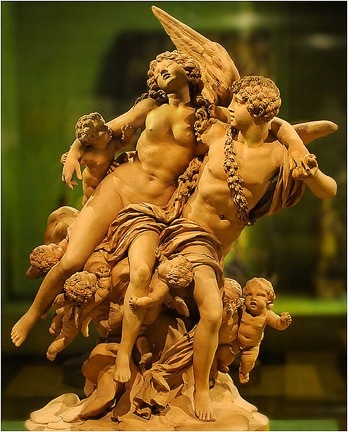 Makes me want to read about the goddess Psyche…in Apulius’ Metamorphosis…and read up on the etymologies of the word “psyche.” I love the fact that the “psyche” is also akin to a “departed soul” and is often represented by a butterfly. Since I’ve undertaken Alexander Technique teacher training I have often felt like a proverbial butterfly. In fact training seems to be sapping all my energy. I am emotionally drained therefore I am physically drained. Not fun. At the moment I am one tired butterfly. I have kept wanting to run away. So much anxiety… Am I finished with the desire to run away from this training? I think I’m (tentatively) at the point of no return…that I need to go on and finish this thing…well certify…for one is never finished with this thing that is the Alexander Technique. The other night I was so stressed out that I kept waking up. A yucky night of insomnia. I had two nightmares that night. One was a really powerful one about my anxiety regarding my training scene. I woke up from it with my heart palpitating. I knew I had to quickly write it down so I could remember it. I got up and did so. While writing the dream down, I had thought that recording it would, once again, really tempt me to run away from training. It did the opposite. The dream was cathartic. Living through that dream was a cleansing experience that hopefully might assist me in carrying on. It amazes me that the psyche can be jarred more by Alexander Technique than by psychotherapy at times. It is so very proustien. Instead of a taste of a bit of madeleine along with some tilleuil, the instigator to remember lost memories can be an experience of a particular chair turn. My trainer says to me now and again that a memory of a painful, past incident is different that the actual incident was. It is not as forceful. This is true, especially when it comes to physical pain, the quality of which is hard to pin down once it is over. We forget. We can know that it was horrible as we know we were screaming for demerol or some such. I guess this is true for psychic pain as well. But the remembered pain, both psychic and physical, is still pretty powerful, dislocating stuff. Going deeply into the Alexander Technique via teacher training can provoke such remembrances, and, at the same time, does provide us with how to cope with remembered, thus newly uncovered pain. And it also provides us with the tools to stop the old pain in its tracks, to divert it, to stop old habits…by replacing them with newer, healthier habits and coping mechanisms. This process is so mysterious to me. But I’ll take it. I want to be a more authentic version of me! I don’t want my soul to depart…I just want the bad stuff to depart! I think you’ll find nobody else wants your soul to depart either. Beautiful writing, beautiful photo.